In this tutorial, you discover a new Google feature that allows you to decide what happens to your data when you die. What should happen to your photo’s, emails and documents when you stop using your account? Google puts you in control. 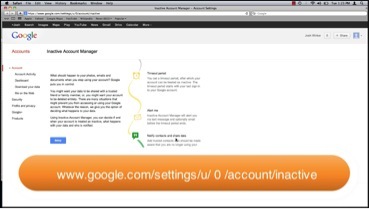 If you haven’t already signed into your google account, you will be prompted to do so at this point. Under Alert Me, You must add a valid mobile phone number. 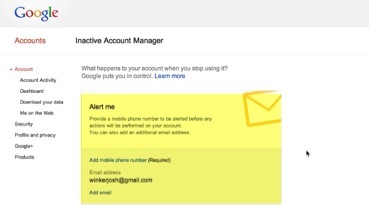 Before google performs any action on your account, it will notify you via text message. 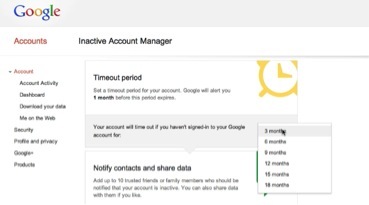 Next, set the timeout period for your account. You can choose between 3-18 months. Next you have the option to notify contacts and share data. 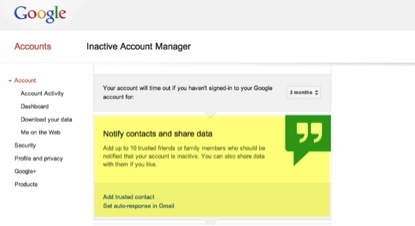 You can add up to 10 trusted friends or family members you wish to be notified that your account is inactive. You can also choose to share data with them. In other words, in the event of death you can choose to have all of your data transferred to close, trusted friend. Lastly, I can choose to have my account completed deleted. 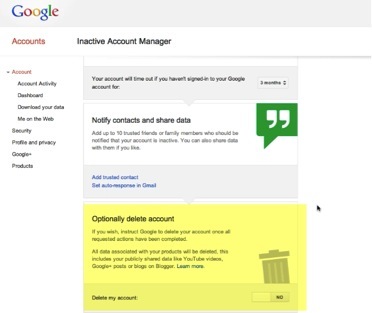 This includes all publically shared data, such as, Youtube videos, google plus posts, blogger posts, etc. Click Enable to save your changes.